Speaker Shawn Simons meets with Cinnaminson, Palmyra students to talk fire safety. 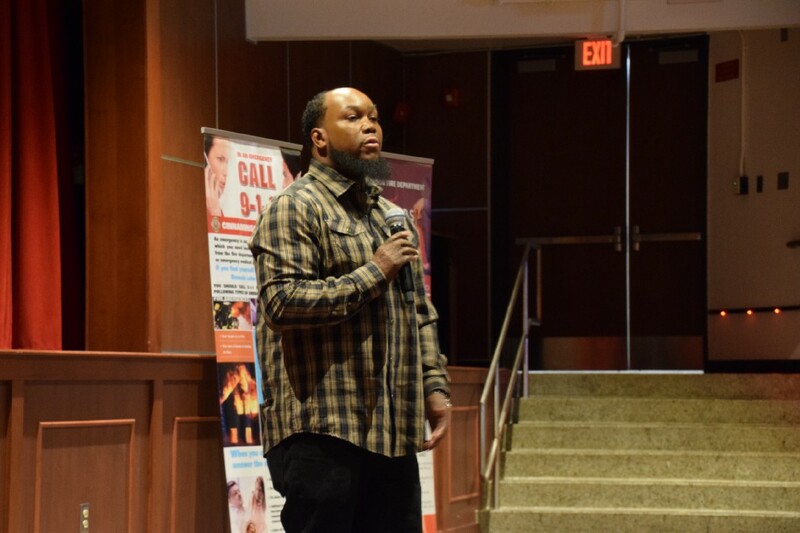 Shawn Simons talks fire safety with Cinnaminson and Palmyra high school’s senior classes in the Cinnaminson High School auditorium. Simons was one of the subjects of the documentary “After the Fire” about the infamous Seton Hall fire of 2000. Students in their final year of high school have a lot on their minds, especially if they plan to make a move to campus housing at a college or university. There are countless considerations and preparations a young adult must contemplate before making what is most likely their first big step in life. Roughly 20 years ago, Shawn Simons and Alvaro Llanos were two such students whose college experience was marred by something that few people, themselves included, consider before making the move to college — fire safety. On Jan. 19, 2000, hundreds of lives were forever changed at Seton Hall University during the infamous fire at Boland Hall. The tragic incident was intentionally set off on the third-floor lounge of Boland Hall by students celebrating their school’s win over a rival basketball team. The blaze quickly spread out of control, and although the building’s fire alarms were tripped, many students ignored the warnings, shrugging them off as yet another drill or false alarm. As a result, three freshman students were killed and 58 others were injured. Simons and Llanos were two of the most severely burned students from the Seton Hall fire. Llanos, whose jacket caught fire while the two were attempting to escape, suffered burns to more than 60 percent of his body. Since then, the two men have devoted their lives to educating young people about their experience and how to make sure a tragedy like the fire at Seton Hall never happens again. On March 4, Cinnaminson and Palmyra high school’s senior classes heard Simons and Llanos’ story firsthand, presented by Simons himself. “We try to take our tragic situation and show young adults the importance of fire safety and fire prevention, especially after they graduate if they go into a college dormitory setting or their own apartments. Just trying to give them some tips that we didn’t necessarily have,” said Simons. Part of the presentation is a screening of the 2011 documentary on the Seton Hall fire, “After the Fire.” The film follows Simons and Llanos through their lengthy, harrowing hospitalization and recovery following the fire and the subsequent investigation into the perpetrators of the tragedy. The film leads to a discussion where Simons says he tries to connect with students at their level and speak from his own experience at their age. “We try to speak to them in their language, we’re not firefighters or fire marshals or their administrators, we were their age when this happened to us. We can relate to them a bit more because we’re not some authority figure,” said Simons. His advice to students is centered around the importance of taking fire alarms seriously. Drills and false alarms can become so commonplace in a dorm setting that some students begin to ignore the warnings — some going as far as to disconnect or cover the alarm in their dorm room. “That’s your first line of defense. If there is an issue, you need to get out,” said Simons. Although the documentary’s subject matter can get graphic at times, Simons isn’t just trying to scare students straight. Beyond the fire safety aspect of his presentation, he hopes his and Llanos’ story of survival will inspire students to push through adversities and challenges they may face in their own lives. “We try to motivate and inspire them that they can go through anything in life,” said Simons.